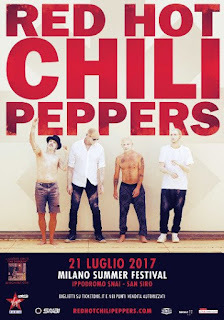 Red Hot Chili Peppers in front of a sold out crowd of 36,000 to close a most successful #MilanoSummerFestival sounds like perfection and it goes fairly close but no cigar this time. The band originating from Los Angeles, as are the very interesting and promising support band Knower with their cool jazzified rock full of neat time changes and real cool band jams, with founder members singer Anthony Kiedis, Flea on bass, Chad Smith on drums, and since 2010 Josh Klinghoffer, who took friend John Frusciante’s guitar spot, are on an 18 month world tour to promote their latest album, The Getaway, and remind everyone exactly who is the number one band around. Is there any other rock band so widely popular in Europe, Stateside and Britain with a pedigree like theirs, indie style who play to thousands, and able to relate to every generation that comes along? Indeed, the crowd here in Milan is largely made up of boys and girls from the 18-28 age range which must be so gratifying for the band. The sound is excellent, the band are absolutely on form with Flea and Chad devastating, quite simply on the button. There are between song jams with Josh that are really neat two minute grooves with the three band members alive and kicking it out. After some initial faltering steps in his first few years Josh has, with his funky, eclectic style has silenced the doubters and it shows tonight as he is brimming with confidence. Anthony is also on song, voice strong and lucid, rather strange mustache but otherwise looking good for a son of ’62. He says absolutely nothing to the crowd which is strange for him and seems rather apart from the trio, exiting the stage during their jams. It’s nearing the end of the long world tour I suppose so maybe some passion has gone and professionalism sets in but it mars an otherwise solid performance. The setlist is not the one I would have wanted (they tend to vary between three types) the one the night before in Rome being perfect but I suspect no Under The Bridge, Scar Tissue, My Friends or Dani California hurts everyone a bit (nothing off One Hot Minute, my personal favorite album). A set that finishes after 75 minutes, add a jam and two songs as encores is just not quite enough for me. You have a duty to personalize a set and as much as I respect playing for yourself and for the band first and foremost, as do RHCP, and indeed they do turn the heat on for sure, you have to look up and interact with the crowd, take in the moment and give a little bit more. In Italy, you cannot leave the stage without playing Under The Bridge. Still, as I’m writing this review, I’m listening to a whole host of their records, and feeling good about myself and all seems ok with this world; So dear sweet @chilipeppers , peace and love till the next time, as always.